A strong contingent of British runners lined up alongside athletes from around the world this morning to take part in the 2018 Al Mouj Muscat Marathon. As well as today’s main 26.2-mile race, organisers arranged a half marathon, marathon relay, 10k and 5k races, plus various children’s events. In total, more than 6,000 adults and children took to the capital’s streets over the past two days, with 86 different nationalities represented. Among the record-breaking field were sizeable contingents from Britain, India the Philippines, France, South Africa and the US. Kenya’s Moses Too claimed first place in the marathon with a time of 2:19:30. First Briton home was David Davies of London, who finished 18th with a time of 3:09:24. British couple Sarah and Martin Steer from near Cambridge also travelled to Oman for the half marathon. They only completed their first full marathon in 2011, but are now part of an exclusive club of only 206 people who’ve run marathons in all seven continents. The pair’s twin sons also got to enjoy the atmosphere of today’s half marathon – albeit from the comfort of a race buggy. 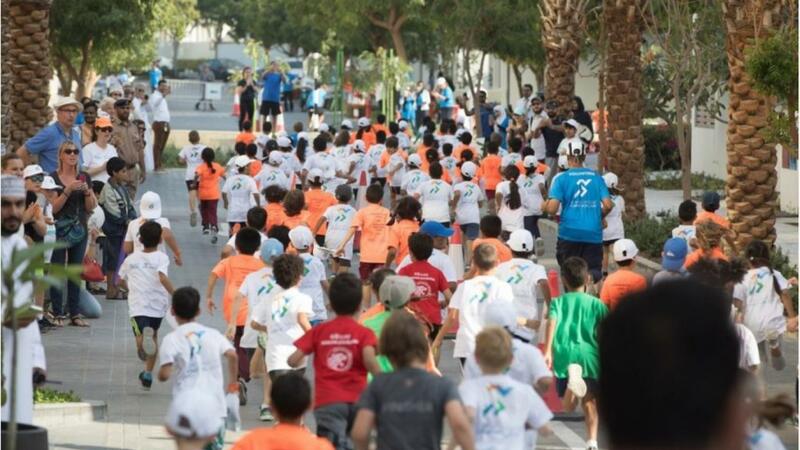 Image:©Muscat Marathon - Young runners pack Muscat’s streets for the Kids’ Run event.